Weekend breakfasts call for something a little more decadent than the virtuous weekday bowls of oatmeal and yogurt. Pancakes are a favorite around here, but they can sometimes mean a little more hands-on time than I like to spend on those lazy mornings. 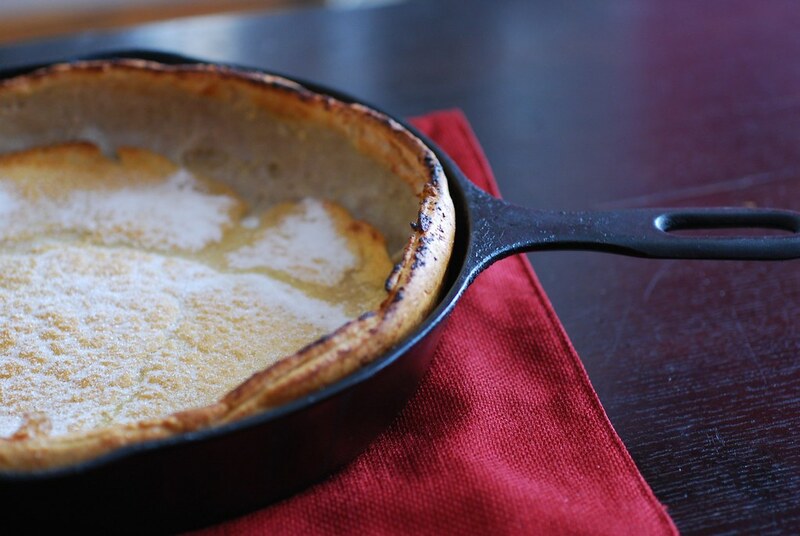 Instead of making a bunch of individual pancakes, Dutch Baby Pancakes are made by pouring all the batter into one big pan that goes into the oven for a lovely and puffy breakfast for two served up family style. 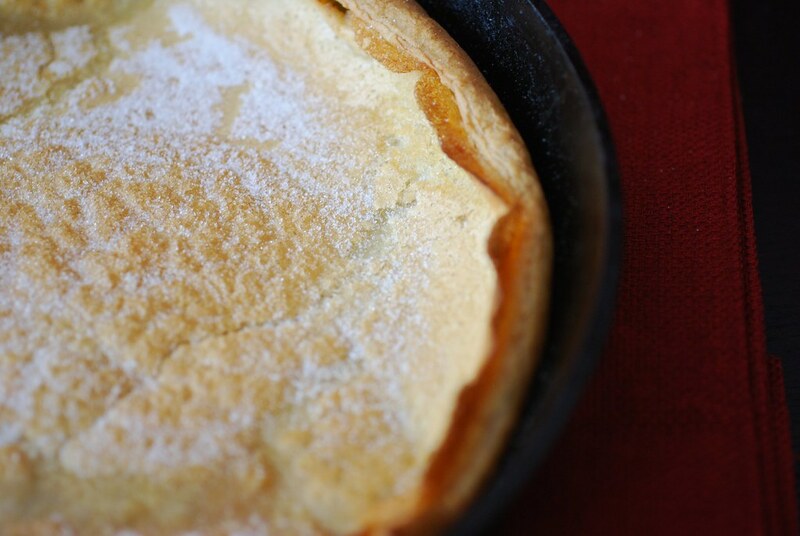 Unlike the soft and fluffy pancakes you might be used to, Dutch babies are light and airy. They puff up high in the oven, and it's a rush to get them (and the family) to the table before they start to fall. The sides usually curve up high and in, like little pancake waves. A generous sprinkle of sugar and a squeeze of fresh lemon juice is the usual accompaniment, but I added a little autumn twist by whisking freshly squeezed orange juice with sugar and Vietnamese cinnamon beforehand. After a few minutes, the sugar melts into the juice and a simultaneously sweet and tart syrup is formed. Drizzled over the still-hot from the oven pancake it is absolutely perfect. 2. Melt the butter over medium heat in a cast iron or heavy bottomed 10" skillet that can go in the oven. 3. While the butter melts, whisk the eggs and half-and-half together in a large mixing bowl. Add the flour and continue whisking until fully incorporated. The batter should be thin and liquidy. 4. With the skillet still over the heat, pour the batter into the pan and swirl it slightly so that it spreads evenly. Immediately place the skillet in the preheated oven and bake for approximately 25 minutes, or until the pancake puffs up high and golden. 5. While the pancake is baking, whisk together the ingredients for the syrup (the juice, sugar, and cinnamon) and let sit until the sugar melts into the juice. 6. When the pancake is ready, remove from the oven and serve immediately. I like to leave it in the skillet and bring it to the table hot and placed over a trivet. Pour some of the syrup in the center and leave the rest on the table in case you want more. I just made skillet pancakes last week and they were great. Now I have to make them again this weekend with your recipe as it sounds like it would be completely awesome. I just made this. ZOMG, Heaven. I'm a first time poster, but I've stalked, um, read this blog for a long time. 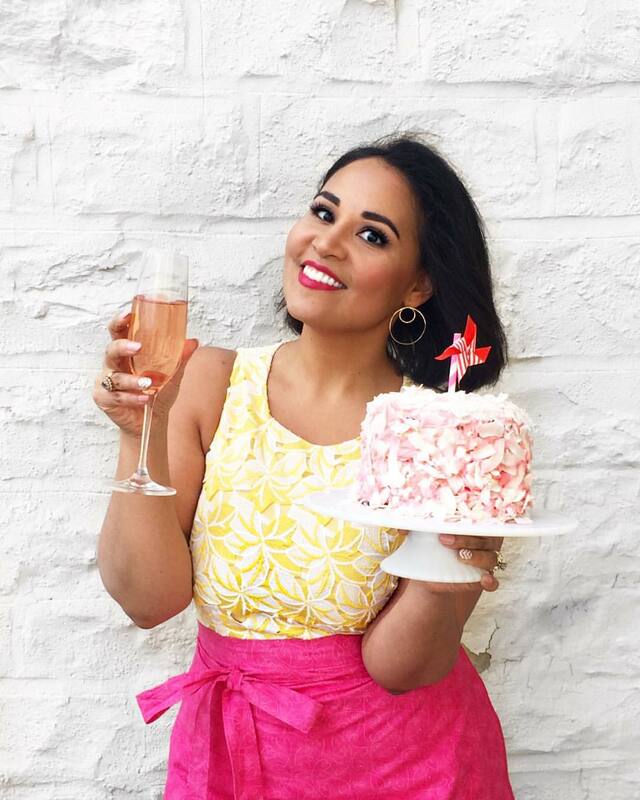 You kind of are my cooking hero, because one, you are doing what I want to do with my life when I grow up, and two, you are a positive Latina role model. I taught young Latinas in a poor neighborhood and the majority don't think they can accomplish anything besides maybe graduating high school. I use you as an example to disprove that. Beautiful! So perfect for a weekend morning. although made in a frying pan instead of a Yorkshire Pudding Tin. Most people have Yorkshires with their roast dinner but you can have them sweet too! Looks delicious!